When working with controls on a UserForm, the VBA code is usually contained in the code window for the UserForm. You can also refer to UserForm controls from a general VBA module. To do so, you need to qualify the reference to the control by specifying the UserForm name. For example, consider the following procedure, which is located in a VBA module. It simply displays the UserForm named userForml. Notice that when the control is referenced in the code module for the UserForm, you don't need to qualify the references with the UserForm name. However, qualifying references to controls does have an advantage: You will then be able to take advantage of the Auto List Members feature, which lets you choose the control names from a drop-down list. Caution Rather than use the actual name of the UserForm, it is preferable to use Me. Then, if you change the name of the UserForm, you won't need to replace the references in your code. 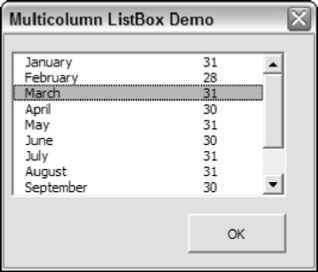 How to reference dynamic userform controls in excel vba? How to count controls on a userform in excel 2007?